College campuses have long been known as hotbeds of political activism. From sit-ins to student government standouts, many of the radical ideas that come to fruition in the halls of Congress have begun because the youngest of voting blocks decided to take a stand. While the medium has changed as time has passed, the messengers demanding change, in between classes and parties, have remained constant. Today’s medium of choice for political action is the tweet. And unlike a good old-fashioned sit-in, this form of political expression allows the interested observer to not just quantify how engaged our students are in the process of selecting the next commander in chief, but predict how each campus will vote come Election Day. 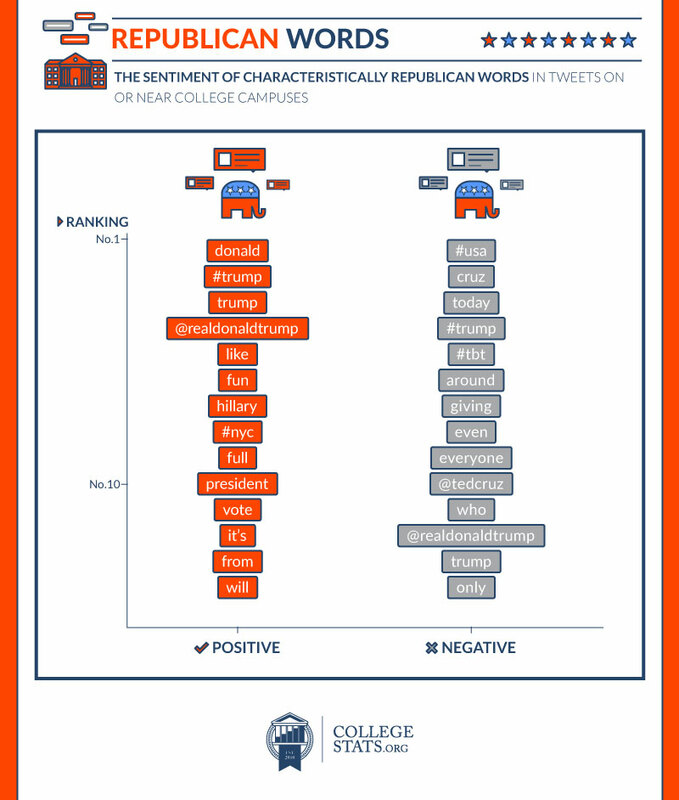 To learn more about what people are tweeting, we analyzed 2.4 million tweets originating on or near college campuses across the country to determine whether their messages were more characteristic of Republican or Democrat leanings. Keep reading to see what we discovered. Nassau County, New York, despite its proximity to the traditionally liberal Big Apple, is currently a GOP stronghold among college-aged voters. There, two of the nation’s top 10 right-leaning campuses within a few miles of each other. 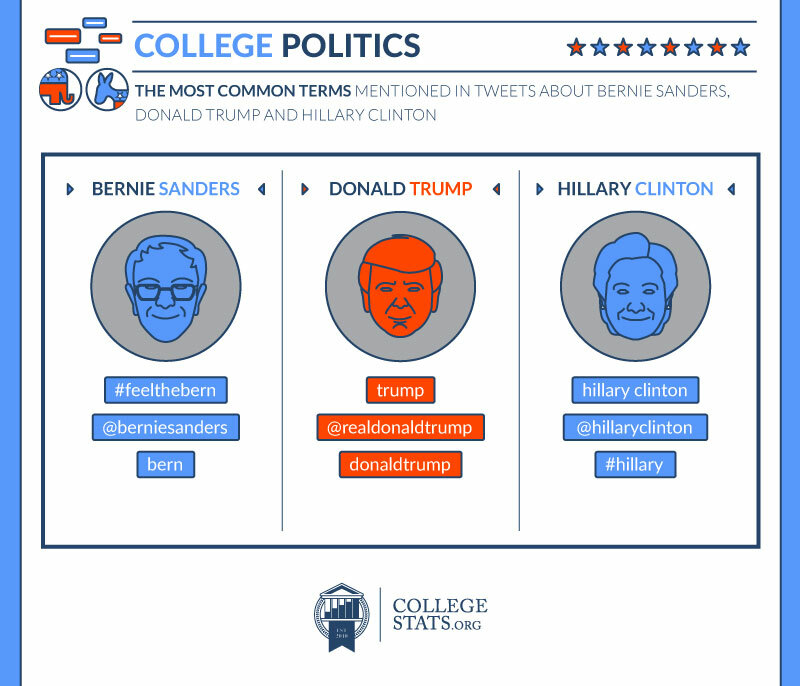 Between Molloy College and Hofstra University, 28.74 of every 1,000 words tweeted from these campuses mention Republican candidates. Molloy, a private Catholic institution with less than 5,000 students, totals 26.53 per 1,000 tweeted words regarding the GOP platform. It is far and away home to the most politically active tweeters in the country, regardless of party affiliation. Georgia’s Columbus State University, with a score of 15.2, ranks second overall. Pennsylvania’s Holy Family University(6.73 score) ranks third-most-active on Twitter for Republican mentions on Twitter. The Great Lakes region tends to tweet liberally – and about liberals – this election cycle. In addition to Carthage College, Wisconsin’s Lutheran College, Buffalo’s Trocaire College, and Michigan’s Albion College all ranked in the top 10 for tweets mentioning progressive politicians. Despite a Democrat score of 4.32 at Albion, the school has a 1.97 GOP score as well, meaning the campus is in the top 10 for both parties. The small liberal arts college is one of only two schools able to claim such a political Twitter presence. Molloy appears in both top 10 lists as well, but its conservative tweets far outpaces its progressive. Therefore, Albion College can boast the most diverse set of politically engaged students on social media. Perhaps this can be attributed to the fact that Albion, a private Methodist college with fewer than 2,000 students, is home to the Gerald R. Ford Institute for Leadership in Public Policy and Service, a school for serious political science majors. Twitter is becoming the new battleground for debate as opposed to traditional grassroots activism. In fact, few of the schools making the cut appear on The Princeton Review’s more traditional rankings of politically active schools, based solely on more detailed surveys of 136,000 students on 380 campuses. 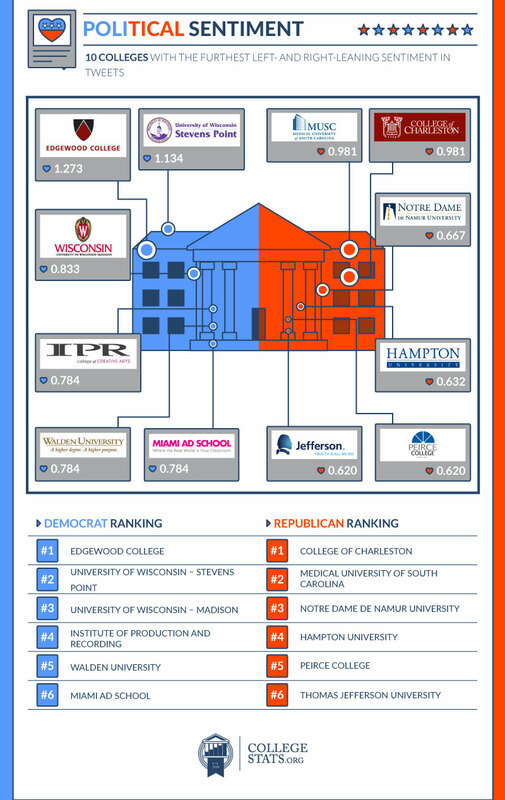 In addition to overall political interest and activity, The Princeton Review releases partisan rankings. And much like the lack of overlap between the battlefield of Twitter and grassroots college activism, partisanship at these institutions doesn’t translate to social media support. On the left, the traditional rankings from the Princeton Review have two Vermont colleges, Marlboro and Bennington, respectively leading the pack, followed by two New York colleges, Bard and Sarah Lawrence. 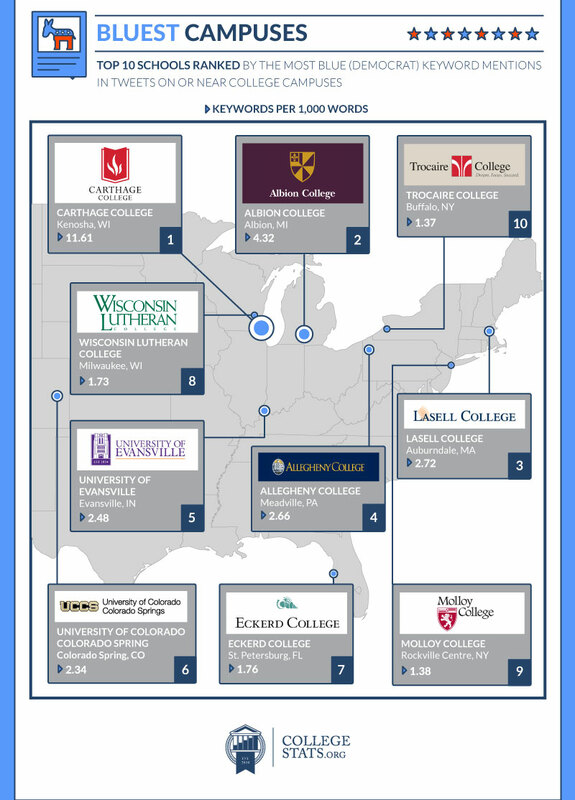 By our new-age Twitter calculations, three Wisconsin schools – Edgewood College, and the State Universities at Stevens Point and Madison – are the three most progressive. Conversely, the Princeton Review reveals the traditional college strongholds of political conservatism are spread out, with Thomas Aquinas College in Santa Paula, California leading the way, followed by Pennsylvania’s Grove City College, Michigan’s Hillsdale College, and Texas A&M University. The new-age Twitter metric shows the College of Charleston and the Medical University of South Carolina to be just as staunchly Republican though. While most of the positive buzzwords surrounding the GOP tend to reference front-runner Donald Trump, interestingly, his onetime friend Hillary Clinton gets mentioned often as well. Most likely, this is referencing the perceived ability of one candidate or another to beat out the Democratic front-runner in the mind of the college-aged Twittersphere. Meanwhile, students may be using a sarcastic hashtag of #USA, possibly referencing Mr. Trump’s plan to build a wall and have Mexico foot the bill – a plan the left almost universally sees as xenophobic. A close second on the negative buzzword list is “Cruz” – a possible sign that the younger base of voters from both sides of the aisle, not just young Democrats, frown on the candidate’s policies and performance on the trail. At this point, it is wholly unsurprising that Bernie Sanders is the lead dog for college-aged voters. Bernie enjoys a huge margin over Hillary among voters ages 17 to 29, to the effect of a resounding 84–14 point victory in the Iowa caucus. Bernie has 1.5 million collective votes in the under-30 category, while Trump and Clinton combine for just 1.2 million. With such sound support on campuses for the first unabashed Democratic Socialist since FDR, the more surprising info is that Mrs. Clinton’s name is so low in the negative column. An interesting analysis is simply how, and ultimately why, each candidate is referred to differently. For The Donald, his last name alone is how he’s referenced most often – which shows his brand recognition outside of politics. Very few people – Madonna, LeBron, and Tiger aside – are on a single name basis with the masses. Mr. Sanders is often referenced alongside his slogan #feelthebern, which must make the campaign’s creative team proud. And Mrs. Clinton, introduced to the public over two decades ago as First Lady Clinton, is rarely mentioned on Twitter without her famous (or infamous) last name. WHAT IS AN UNDECIDED VOTER? A time-tested tradition of presidential campaigning is not wasting time in places you know are already wrapped up. So which college campuses shouldn’t expect a visit this election cycle? 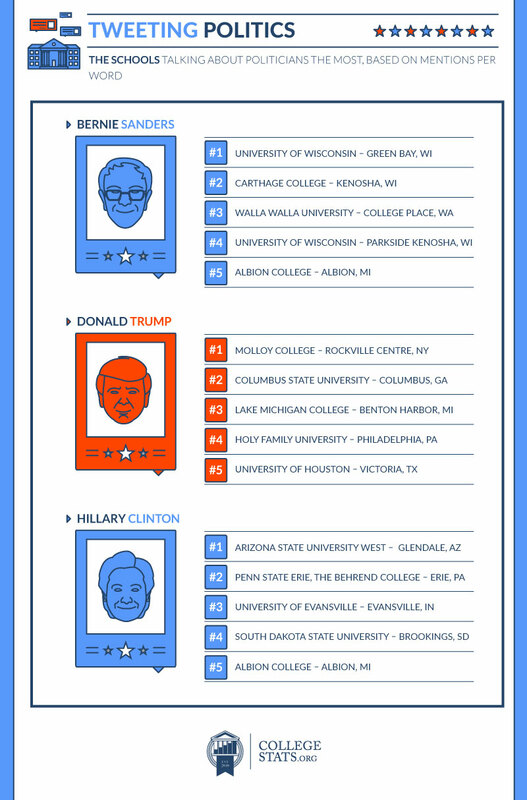 While the above graphic doesn’t indicate positivity nor negativity toward the three candidates, it does show which schools are tweeting about the presidential hopefuls the most. The public university system of Wisconsin could be Feeling the Bern; two of its schools are taking to Twitter with mentions of the Vermont senator. Mrs. Clinton garners attention on the social network at the state colleges of Arizona, state colleges of Pennsylvania, and state colleges of South Dakota. Of course, the aforementioned Molloy College makes a showing for Mr. Trump here as well. Engaging your fellow classmates and your university’s faculty in political discourse – whether through social media rants or calmly composed dialogue – is a great way to learn. But it is only one feature of college life and culture today. At CollegeStats.org, we take a look at all sorts of college data from diverse sources to learn more about emerging trends. 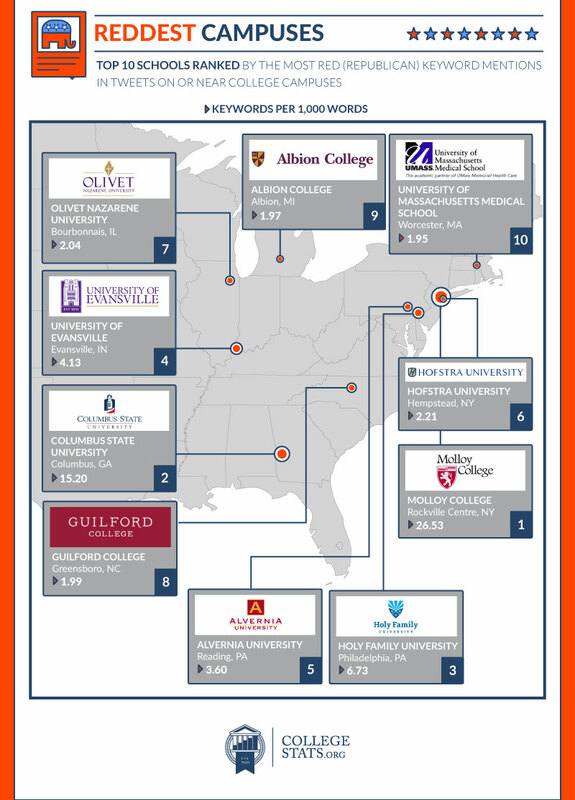 Take a look for yourself and keep your eyes open for more fascinating facts we discover about colleges across the nation. Starting with a data set of over 11 million tweets, we selected 1,537 universities with 2.4 million tweets for analysis. We looked at tweets coming from within one mile of a college campus center with 1,000 to 4,999 students enrolled for credit and within three miles of a college campus center with over 5,000 students enrolled for credit. We narrowed the focus of the project to public and private four-year universities with at least 1,000 students enrolled for credit and at least 1,000 total words counted in tweets coming from within the boundary. Out of the final data set of 2.4 million tweets, the tweet corpus was stripped of numbers, symbols, and extra whitespace, and then used to create a term-document matrix (TDM) containing unigram and bigram word counts where each university represented a document (column). For the most red or blue colleges, the TDM was used to total related keywords for each school and divide that count by the school’s total word count to derive the rate at which those words were used. For the Republican or Democratic colleges, a subset of tweets from each college containing either red or blue keywords was made and analyzed with the polarity function of the R package qdap. The polarity was averaged for a red average and a blue average. 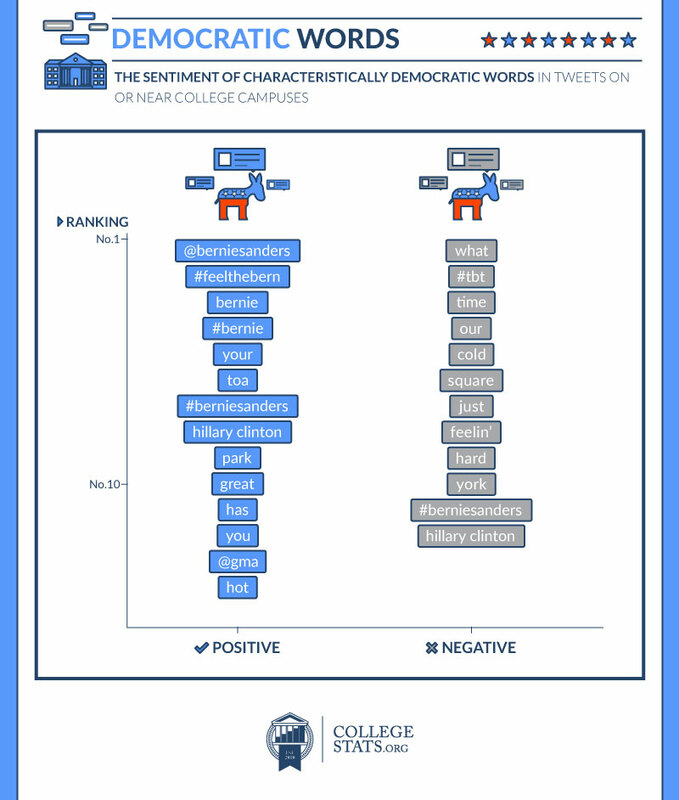 For the most characteristic words in red or blue tweets, the tweet corpus was separated into four documents: positive Republican tweets, negative Republican tweets, positive Democrat tweets and negative Democrat tweets (based on sentence-level polarity). Each document was then compared against the other three using a log-likelihood statistic to isolate keywords that occur more often than would be expected in that particular document.